Many times when people begin to cook at home they begin to look at it as an adventure, as opposed to a chore. When this happens, they become creative. I know people who started cooking with a crock pot and before long they moved from culinary terror to culinary delight. Many people have had the same experience when they get a grill. 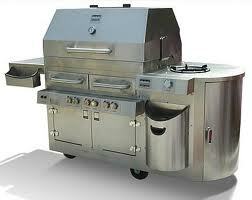 Now don't go overboard when you buy a grill; many people go hog-wild and overbuy. Besides, you may find that you don't like it. Start small, you can always buy up. May I even suggest one of those table-top grills that is perfect for fixing for a small family. You may want to purchase one even if you already have the gargantuan Weber for times when you're only cooking for a couple of people. The best thing is that it only takes a handful of charcoal briquettes. Otherwise, it's kind of like driving your hummer to the grocery store just to pick up an onion. You can go another step on the money-savings route by purchasing Sam's Choice charcoal briquettes at Walmart. For a mere $6.50 you can get 30 lbs. of charcoal. It's actually better because the briquettes are larger and they burn longer. Since the store brand is not "match-light," you gotta figure out how to light it: buy a charcoal chimney. You put scraps of junk mail on the bottom with the charcoal on top. Light the paper and in a few minutes the charcoal is hot enough to start cooking. Besides, it's a great way to get rid of junk mail. Cooking at home can save a ton of dough and the biproduct is you get your steak cooked exactly the way you want it; you only have yourself to blame if it doesn't come out the way you like. Who knows, you may end up liking this cooking stuff and become a gourmet chef. What are some of the meals you would like to fix on the grill?